The season for passionfruit is here! These muffins are delicious. I iced mine while they were still warm, hence the runny icing... but they still tasted just as good. Note: This recipe requires about 6 passionfruit. Preheat oven to 200 deg C. Grease twelve standard muffin cups or line them with parchment paper cases. In a large mixing bowl, sift the flour. Stir through the sugar. Make a well in the centre. In a small mixing bowl, combine the eggs, milk, butter, and the 1/2 cup passionfruit pulp. Add all at once to the flour mixture and stir just until moistened (the batter should be lumpy). Spoon batter into prepared muffin cups, filling them 2/3 full. Bake until golden brown, 15-20 minutes. Cool in pan for 5 minutes, then transfer to a wire rack. For the icing, sift the confectioners' sugar into a small bowl. Add the 3/4 oz melted butter and enough of the passionfruit pulp to mix to a smooth and spreadable consistency. Spread the icing over the cooled muffins and allow to set before serving. YUMMY!!! i love passion fruit. have never grown a vine as I've always thought it would take too long before we got any fruit... are these store brought passionfruit or do you have a vine? wow, delicious! You should open a cafe or a pastry shop! Your baking goods look so good. Oh yum! You are the bomb! You take great baking photos too by the way. Always makes me want to go and make something. Just made some! Yummy. 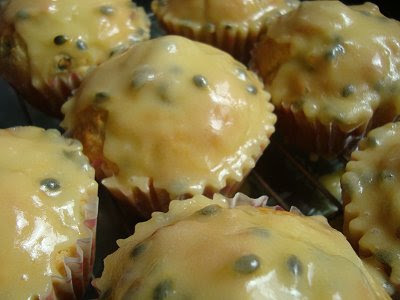 I had some passion fruit pasterie filling in the fridge which I used instead of the pulp. and made mini muffins for the hubbys linch and for the girlies. Thanks will definately make these again.